The least controversial indication for partial adrenalectomy is hereditary pheochromocytoma. than 6 cm in diameter is low—1 in 10,000 (15-17). 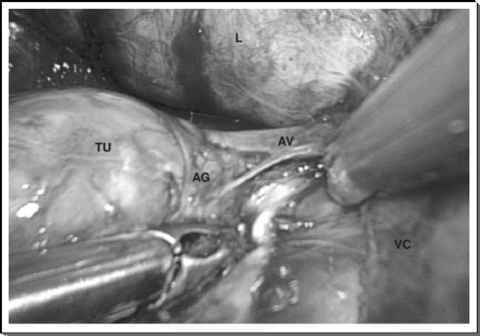 However, micro- or macronodularity in an adjacent area of the gland is present in 7% to 38% of aldosteromas, a circumstance that is a clear contraindication for partial adrenalectomy (18). The major cause of Cushing's syndrome is adrenal hyperplasia. A small percentage of patients with Cushing's syndrome have a radiologically well-defined adenoma amenable to partial adrenalectomy. Cushing's adenomas are usually larger in size (several centimeters) than aldosteromas, and the adjacent adrenal parenchyma and the contralateral adrenal gland are often atrophic. 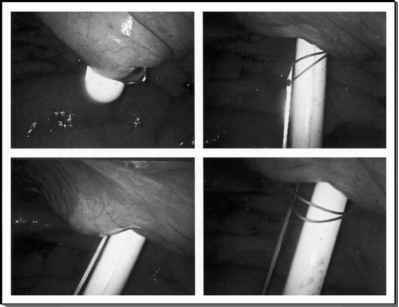 laparoscopic partial adrenalectomy is technically more challenging in such cases. Because of this, the remnant adrenal recovers slowly, with the need for temporary steroid substitution. FIGURE 1 ■ Recurrent right pheochromocytoma after dissection. Note the clear distinction between tumor-containing adrenal gland and normal adrenal gland, and the adrenal vein could be spared after ligating the small venous tributary draining the tumor. Abbreviations: L, liver; TU, tumor mass; AG, normal adrenal gland; AV, adrenal vein; VC,vena cava. recurrence over a median follow-up of 54 to 88 months (22,23). Considering the available evidence, partial adrenalectomy appears to be well justified, given the rarity of malignant tumors in inherited pheochromocytoma (10). Subtotal adrenalectomy has been advocated (23-25), but this does not necessarily remove all medullary tissue and hence the risk of recurrence remains with the additional disadvantage of removing an excessive amount of cortical tissue, thus compromising the adrenal function.